The first time Steven and I ever saw our sweet hound Electra, she was standing back, behind a wiggling wall of a half-dozen jumping, howling beagles, as if waiting her turn to come and greet us. We fell in love immediately with her droopy, half-basset face and her gentle, easy-going personality. When I was pregnant with Cadence, Electra would often climb up onto the couch next to me to take a nap, sleeping with her head resting on my burgeoning belly. 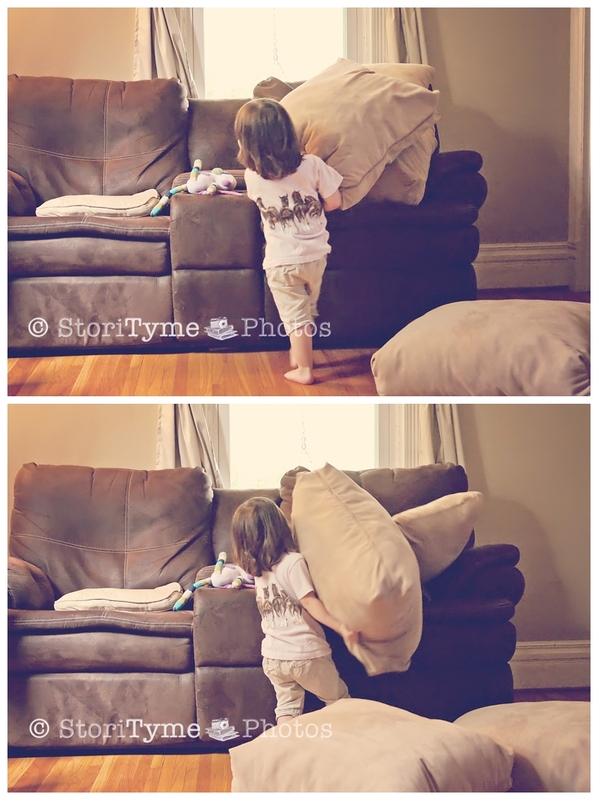 Later, when we brought our new baby home, Electra quickly grew so attached to the newest member of our family that she didn’t even want us to leave the house with Cadence. As Cadence grew, she wasn’t quite sure what to think of this hound who was always either trying to snuggle up against her or steal her food. 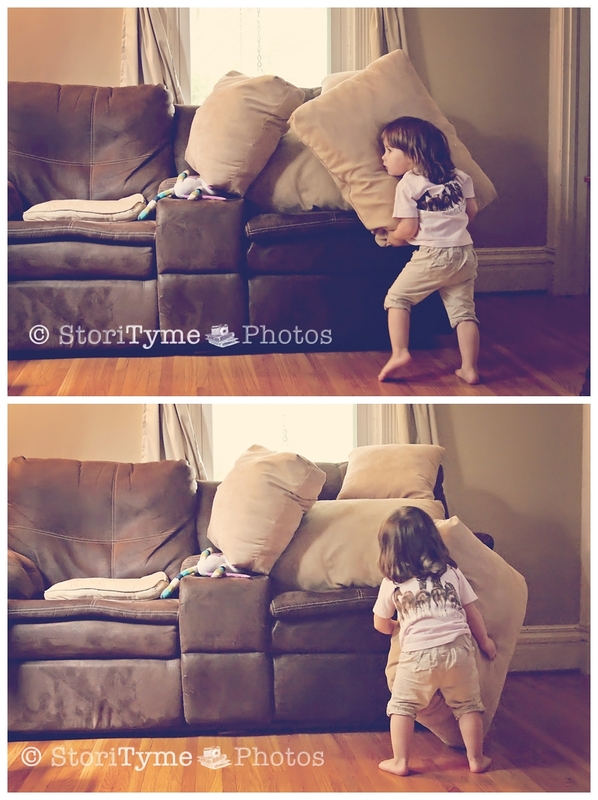 She thought it was fun to crawl into Electra’s dog bed, and even learned to stand and walk by grabbing fistfuls of Electra’s loose skin to pull herself up on her feet. 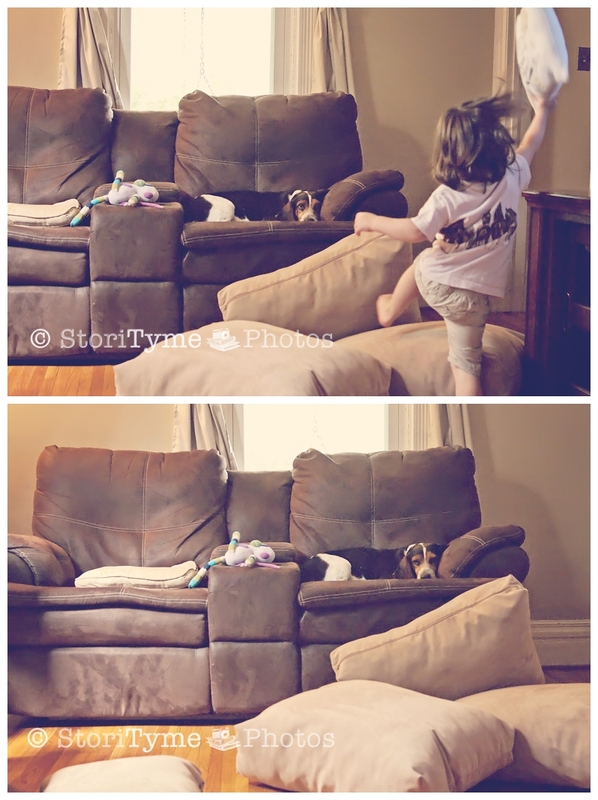 As soon as she was fully mobile, she discovered how fun it was to chase Electra around the house and toss her treats for being a good dog. These days, Cadence loves “Dectra”. She smiles and says “Hi Dectra” each morning when she gets up, and gives her a hug and a kiss at night before she goes to bed. She follows Electra around the house, sometimes just playing Follow the Leader, other times chasing Electra with her toy lawnmower or the laundry basket. The best, though, is when Cadence tries to get Electra involved in one of her games. 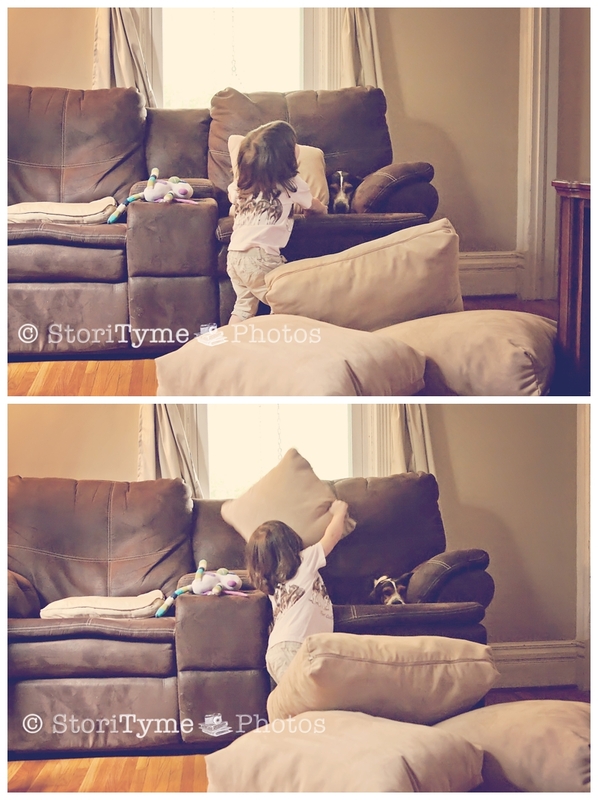 Just yesterday, I managed to get these shots of my favorite girls as Cadence tried to interest Electra in a little fort-building with the couch cushions. Seriously, who needs television when you’ve got this kind of entertainment? Previous Entry Happy Mother’s Day!